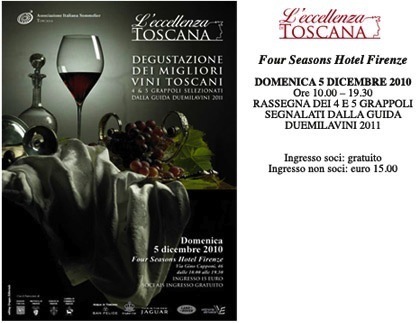 This Sunday, December 5th, is the annual L'eccellenza di Toscana wine tasting by AIS. This event was historically held at the Grand Hotel in Piazza Ognissanti which is currently being renovated, so this year the venue is the new Four Seasons hotel (which is great as I have yet to see the hotel from the inside). I have only been to this event once and it was one of the most memorable tastings I have ever attended in Italy or anywhere. Over 300 producers, and only the best of Tuscany. Highly recommended if you are in Florence this Sunday. 15€ at the door for non AIS members. There is also an optional dinner afterward (see their site for details).